To All Families & Friends of The MIGHTY Roos! Anzac Day is a time for the community to come together. 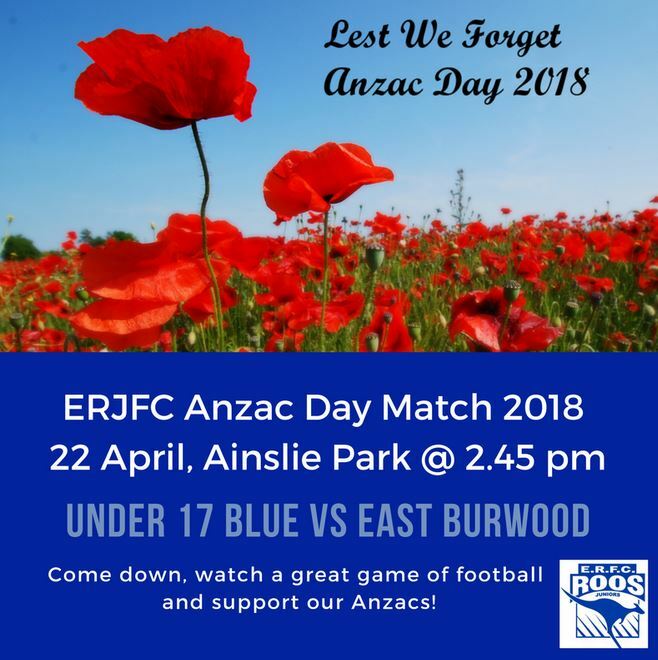 Take the opportunity to commemorate early by coming down to support ERJFC’s U17 Blue Anzac Day Match this Sunday 22nd April, 2.45pm at Ainslie Park Football Club. Prior to the commencement of the game will be a minutes silence in honor of our Anzacs. Following the U17s game our club rooms & bar will be open for our first Coach Report Night for 2018. Make sure you come along and catch up on how all our amazing teams have gone in Rounds 1 & 2, along with feedback on our U10’s Lightening Premiership, award presentations, great food and much more. 3rd 2018 Coach Report Night Sunday 24 June from 5pm at our Senior Ground (East Ringwood Reserve) - Come join the FUN! 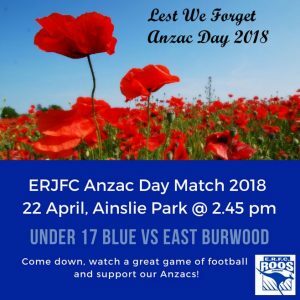 No Replies to "ERJFC U17 Anzac Day Match Sunday 22nd April, 2.45pm at Ainslie Park Football Club .... Lest we Forget"